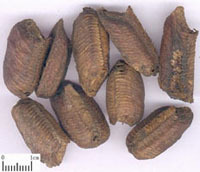 Ootheca Mantidis is the dried egg capsule of Tenodera sinensis Saussure, Statilia maculata (Thunberg) or Hierodula patellifera (Serville) (Fam. 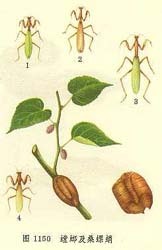 Mantidae), commonly known as "Tuanpiaoxiao", "Changpiaoxiao", and "Heipiaoxiao" respectively. The drug is collected from late autumn to next spring, removed from foreign matter, eggskilled by steam, and dried. sang piao xiao is indicated in the treatment of enuresis, spermatorrhea and shingles, etc..
Pattern: Nourishes the Kidney, supports yang, fortifies Essence and reduces urine. Properties: Sweet, salty, neutral. Non-toxic. Channels entered: Liver, Kidney and Bladder. The main ingredients of sang piao xiao are protein, fat, course fiber, Fe and Ca, etc..
sang piao xiao, duan mu li, 12g each; jiu cai zi 6g; ku fan 3g were decocted to 50ml juice. Take the juice before sleep. 50 cases of children's enuresis were treated, 45 were cured and 5 ineffective. sang piao xiao 10g; tu si zi, gou qi, bu gu zhi, 12g each; sheng long gu, sheng mu li, 25g each; with impotence, add dang gui, bai shao and zhi gan cao, 12g each; wu gong, 2 pieces. sang piao xiao was baked with a slow fire to charred ones, and grounded into fine powder, which was mixed with sesame oil into paste and applied to affected areas of shingles, 3~5 days every day. 30 cases were cured and all were cured.